"His passion was life. His obsession was art." 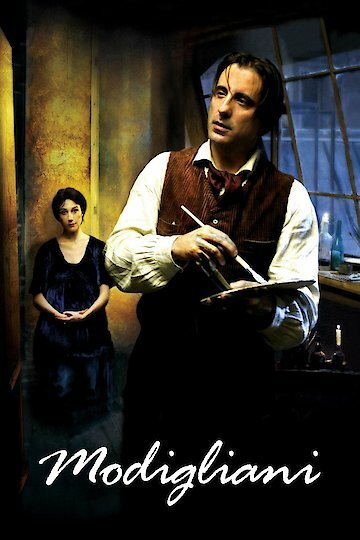 Modigliani is a 2004 film directed by Mick Davis and starring Andy Garcia as the painter Amedeo Modigliani. The film is loosely based on the life and career of Amedeo Modigliani. It portrays the artist’s struggles in his effort to become an established painter. Modigliani’s relationship with Jeanne Hebuterne is a central part of the film. Modigliani is a struggling artist when he meets Jeanne, and eventually they have a child together. The film also shows his interactions with Pablo Picasso and the rivalry that he and Picasso had in Paris. Modigliani was born in 1884, and the film is set in 1919 Paris. He interacts with a number of well-known artists such as Picasso and Diego Rivera. The film shows the lives of some artists, both struggling and successful, and it shows how Modigliani struggled with his own personal problems while trying to start a family and find success as an artist. Modigliani is currently available to watch and stream, download, buy on demand at FlixFling, Sling, CineFest, FlixFling VOD, Amazon online.